One of the things I did during this recent hiatus, though, actually had something to do with this blog: On Friday, I had a chance to sit down and chat with Faisal Ahmed, co-chairman of Kawaii Kon and Hoku Kon with Marlon Stodghill, about a number of things related to the two conventions. I’ll have more of that conversation posted … umm … eventually (the resolution of that outside-of-work stuff is still very much up in the air), but the biggest thing to emerge from it came at the very end. In a move confirmed on Hoku Kon’s Facebook page last night, the convention has rebranded itself and is now going by the name Comic Con Honolulu. Which then … with dealing with sci-fi guests, is what they care about. Even if you’re willing to pay a lot of sci-fi guests, they’re not willing to come out unless the show has 7,000 people, 10,000 people, 20,000 people. Because it’s just not worth it to them. And ultimately … my dream for Hoku Kon or Comic Con Honolulu would be to have studios come out, to have Marvel come out and have a presence, have HBO, have Cartoon Network, have all these people come out and basically give people the opportunity to have this interactive experience without having to spend the $10,000 to actually go to San Diego Comic-Con or go to another show on the mainland, or buy a ticket that’s $300. This is actually the first time we’re actually talking about it or announcing it. We’re working on kind of finalizing how it’s gonna happen, just because rebranding is always an arduous task. So we’re going to start having it called Comic Con Honolulu, just so people (a) know where it is and (b) know what it is. We’ll keep the name Hoku Kon as a byline, just because … we have to remember that “hoku” means “star” in Hawaiian, it is a local show. It’s gonna be run by locals, the events are gonna be done all by locals, and again the only mainlanders to do anything are Marlon and I, and our job is support, is to make sure that we can provide all the tools necessary for the show to happen. … We have to get people kind of used to the name, and used to understanding that Hoku Kon is the exact same thing, it’s run by the same people. It’s just going under this new name to make sure people know what the event is. And the reason we didn’t call it “Hawaii Comic Con” or “Comic Con Hawaii” was just because there’s already HawaiiCon, there’s Amazing Hawaii Comic Con. And we wanted to show that we’re doing something, again, more local. And so that’s why we picked the city. Amazing Hawaii Comic Con is sending down several staff members for an informal meet-and-greet starting at 7:30 p.m. today at Dave & Busters (1030 Auahi St., in the Ward Entertainment Complex). Come down and chat with them; they’ll even buy you your first drink. Anime Matsuri Hawaii‘s Artist Alley table registrations are now live; cost is $170 (plus a $5.24 Eventbrite processing fee) and includes a 6-by-2-foot table, one three-day pass and limited electrical power. Read up on all the rules and sign up at ow.ly/MiE7s. The convention also recently announced its first anime industry guest: Maile Flanagan, the English voice of Naruto Uzumaki (who now follows me on Twitter, *squee*). Three-day passes are $45 through June 15; visit ow.ly/MiGCt to get that set up. Anime Ohana still has their three-day pass for $25, but you’ll have to act fast; that special ends tomorrow. Visit animeohana.ticketbud.com/anime-ohana. And for those of you who really want to plan ahead, Kawaii Kon has opened online preregistration for 2016 — three-day passes are $45 general, $40 ages 5-12. Get started at ow.ly/MiJds. (Anime/manga fans’) passion will be on display throughout the weekend as Kawaii Kon, the first anime convention to be held in Hawaii, starts tomorrow at the Ala Moana Hotel. … All of this comes courtesy of a team led by convention director Stan Dahlin. Kawaii Kon is a homecoming of sorts for Dahlin, a 1983 Radford graduate who has helped stage a similar convention, Anime Weekend Atlanta, for the past 10 years. Since then, Kawaii Kon has grown into the first name people have thought about when considering local anime conventions. Heck, the show drew more than 10,000 people this year. While there’s been a competing event here and there these past few years, it’s a reign that’s gone pretty much unchallenged. And then came this year. If you’ve been reading this blog for a considerable amount of time, you already know that this year has been the most remarkable one I’ve ever seen in terms of incoming conventions. Kawaii Kon’s in the books, but to recap, there’s still Hoku Kon in July, HawaiiCon (on Hawaii island) and Amazing Hawaii Comic Con in September, and Anime Matsuri Hawaii in November. That’s five conventions that we knew about before Kawaii Kon kicked off in late March. Soon after Kawaii Kon ended, though, tag-team partner in fandom Wilma J. alerted me to some buzz making the rounds during con weekend. A sixth major convention — and the third anime-related one, to boot — had emerged as a new challenger on the local scene. And after a few weeks of looking at the website, monitoring some of the social media chatter about it and securing a contact from within the organization, I finally have enough confirmed information to pass along to you, dear Otaku Ohana readers. Meet Anime Ohana, a convention that’s happening Oct. 9-11 at the Pagoda Hotel. As someone who posted a confirmed registration receipt noted, the event is being presented by Hawaii Anime Fairs LLC, a business partnership that formed in Texas in December with two names on the paperwork: Stan Dahlin and David Williams. That’s right: The founder of Kawaii Kon, who left that con’s leadership team in 2013, has created a new convention for local fans, and will be running and managing it with help from the longtime ADV/Sentai Filmworks producer. Along for the ride are Anime Ohana’s first confirmed guests, voice actresses Jessica Calvello and Monica Rial. This will be the first isle convention visit for Calvello, known for her roles as Hange Zoe in Attack on Titan, Yuri in Dirty Pair, and the voice of Excel for 13 episodes of Excel Saga before she had to withdraw due to vocal chord damage. Rial, best known as Kaede Kayano in Assassination Classroom, Bulma in Dragon Ball Z Kai, Hyatt in Excel Saga and about a bazillion other roles (seriously, look at her Anime News Network encyclopedia page) was a guest at the first five Kawaii Kons but has not been back since 2009. “Our guest list, both currently announced and possible announcements, is focused on people who haven’t been to Hawaii before or haven’t been back in many years,” Williams said. There’s also been a bit of discussion on social media on whether the event is, indeed, legitimate, with conflicting reports on whether the Pagoda had even been locked up as a venue in the first place. Williams reassured me on that front as well. Interested? If you preregister before May 1, you can get a three-day pass for $25. VIP passes — which include a free T-shirt, head-of-the-line autograph privileges, early entry/seating to all con events and the dealers room, and special one-on-one events with con guests — are also available for $150. And you can order a T-shirt for $25. All of that is available at animeohana.ticketbud.com/anime-ohana. “We are working hard to put on a good show for the fans, and we hope they enjoy our events and meeting our guests and just have a good time,” Williams said. To keep up with the latest Anime Ohana happenings, visit the website at animeohana.com, “like” their Facebook page, and/or follow their Twitter feed. This year’s Kawaii Kon was huge. An announced 10,450 people passed through the tightened-security halls of the convention center. I Instagrammed and tweeted whatever I felt like Instagramming and tweeting, took all three days to track down friends in Artist Alley (a task that used to take just a handful of hours to do on the first day), even helped the Otaku Ohana Anonymous Director of Forced Social Interaction deal with a thing or two. When it was all over and I filed my annual Kawaii Kon memorable moments post for Honolulu Pulse, I resolved to take some time off to recharge some seriously drained blogger batteries. I just didn’t think it would take a good chunk of two weeks for me to feel like those batteries had finally reached “ready to write again!” status. Heck, an entire wave of Nintendo’s Amiibos was announced, then promptly sold out, in less time than that. (I’m sad, too. I really wanted Ness.) Which means that a backlog of blog posts that I have yet to write, including interviews with manga artists Erica Sakurazawa and Moyoco Anno, has grown even larger in the meantime. Apologies for that. So I’ll start off a little small and work my way up to the bigger posts I had in mind. Our starting point: the upcoming Hawaii International Film Festival Spring Showcase at the Regal Dole Cannery Stadium theaters. 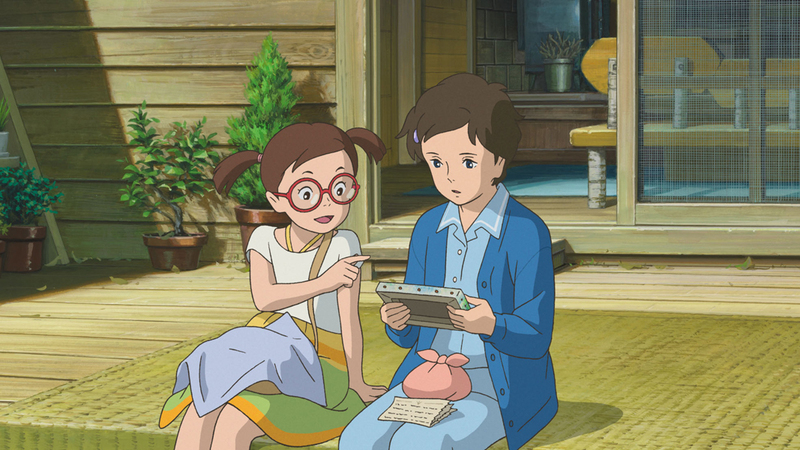 It kicks off Friday and runs through April 19, and Anderson Le, festival programming director, emailed me during my recharging period to give me a heads-up about two movies that might be of interest to you, dear Otaku Ohana readers. Sent from her foster home in the city one summer to a sleepy town by the sea in Hokkaido, Anna dreams her days away among the marshes. She believes she’s outside the invisible magic circle to which most people belong – and shuts herself off from everyone around her, wearing her “ordinary face.” Anna never expected to meet a friend like Marnie, who does not judge her for being just what she is. But no sooner has Anna learned the loveliness of friendship than she begins to wonder about her new found friend. When Marnie Was There screens April 18 at 6 p.m. and April 19 at 4:45 p.m.
Forty-eight-year-old Wataru Honjo is a big fan of Bruce Lee and works as a suit actor (costume wearing stunt performer). He is also president of “Shimoachiai Hero Action Club.” Even though he doesn’t have the typical body for his profession, he has worked in the business for 25 years. When Ryo Ichinose, a cocky rookie actor appears on the scene, they don’t get along at all. However, when Ryo cast in a Hollywood movie and then suddenly quits because its too dangerous, the producers approach Wataru to fill the role…Will he go for it? Unsung Hero screens Saturday at 1:15 p.m. and Sunday at 3:15 p.m. If you still need tickets for either of those films’ screenings, you’ll definitely want to use the discount code SPRING17 at checkout when you buy your tickets online; that will allow you to take $4 off the cost of what’s usually a $12 general admission ticket. Quite the deal! For more information or to check out the other films at the Spring Showcase (33 films from 12 countries! ), visit hiff.org.